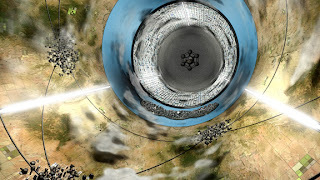 Biology in Science Fiction: Free Friday Flick: Rendezvous with Rama short "trailer"
Free Friday Flick: Rendezvous with Rama short "trailer"
This week's recommended free movie is a short film inspired by Arthur C. Clarke's novel Rendezvous with Rama. The movie was a student project by Aaron M. Ross, who is now lighting director at Blue Sky Studios. He has gone on to work on visual effects on a number of animated movies, including Horton Hears a Who! and the Ice Age sequels. Rendezvous with Rama - NYU 2001 from Aaron Ross on Vimeo. The short "trailer" for a Rendezvous with Rama movie is a mix of live action and computer graphics. In the video showing how the film was created, you can see how Ross used actors attached to cables acting in front of a green screen to simulate the low gravity environment aboard Rama. The short only covers the first part of the story, where a team of astronauts and scientists is sent to explore a mysterious massive cylindrical object travellng through our solar system. This will have to satisfy fans until the long-discussed Morgan Freeman feature-length film of Rendezvous with Rama is actually made. Freeman has stated as recently as last February that he still intends for that to happen. I would love to see a well-done movie version of the story. I think that special effect technology could actually capture the vast interior living space inside the cylinder, the circular sea, and the variety of "biots" that live and work there. But in Hollywood, it seems there's no guarantee a movie will be made until it's finished and scheduled for release - and maybe not even then. In the mean time you could read the original novel , published in 1972 and winner of both the Hugo and Nebula awards. It does a great job evoking of the sense of wonder in exploring a truly unknown territory, even under dangerous conditoins. Watch the Rendezvous with Rama short on Vimeo or YouTube. Image: Artist's depiction of the interior of Rama at Wikimedia Commons. Original uploader was Monomorphic at en.wikipedia Released into the public domain by the artist.